I nearly purchased a Ti-82 several months ago on the well know auction site. However it looked damaged (screen cover missing) and not really worth repairing. Is there anything special with these machines or is it just a curiousity value ? Functionality-wise, they're not that different from the TI-83, TI-83+, or even TI-84+, lacking only some of the most advanced statistics features and Apps. If you have one of the newer calculators, however, this is likely a curiosity more than anything. *bump* Finally got around to cutting off the bottom of the calculator's mainboard and fitting it in the case. I also see how I can easily fit on a new link port, which is nice. Unfortunately, the LCD has degraded over time (as all TI-82 LCDs tend to do), so I need to try to fix all the dead columns. Edit: Aaaaand, a few hours of work later, it is complete! Here's the full set of details. Two days short of a full year ago, I started a project to build a TI-82 Plus: a mashup of a TI-82 and TI-83 Plus. 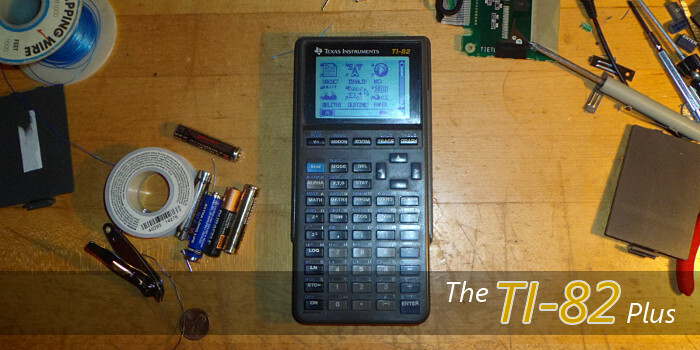 I had recently acquired a large number of TI-82 calculators for a good price, and with many of them displaying the classic missing row/column problems that plague TI-82 and TI-86 calculators, I was looking for interesting hacking projects. I decided to keep all the outward appearances of the TI-82: the characteristic blue-scale LCD screen, the keyboard, the case, and the battery compartment. At the same time, I wanted the calculator inside to be a true TI-83 Plus. To make it extra-special, I decided to use the mainboard from one of the 1999 TI-83 Plus calculators in my collection, sporting the rare discrete z80 CPU. I set out to combine the mainboard from the TI-83 Plus with the LCD, keys, keyboard membrane, and case of the TI-82. The project turned out to be not so simple. I painstakingly soldered the foreign LCD and mainboard together, and soldered TI-82 battery contacts onto the TI-83 Plus mainboard, but I soon hit a snag. Although consistency in TI's designs meant that the holes in the TI-83 Plus mainboard even matched the screw sockets in the TI-82's case, the mainboard was about half an inch too long for the case. Of course, something had to be done, and that something was dremelling off the bottom half-inch of the mainboard. The calculator now functioned (after having to replace the LCD a few more times after the calculator sitting dormant for nearly a year), but it had no link port. 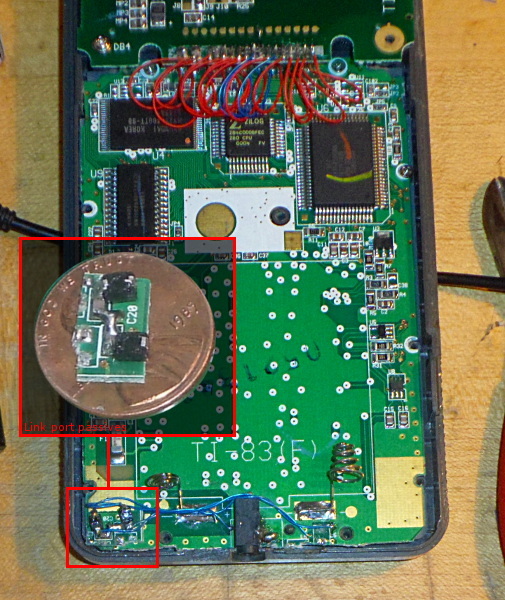 That bottom half-inch of the PCB contained the link port and four passive components necessary to protect the link port and the calculator components beyond. To solve this, I hacked together a small dead bug-style PCB fragment containing the two capacitors and two inductors, superglued it to the mainboard, drilled two tiny holes into the PCB to seat the now re-placed link port, and wired the whole thing up. 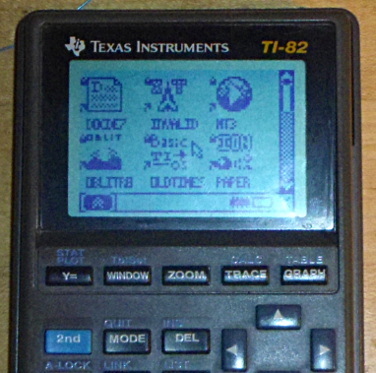 Voila, I was able to send Doors CS 7 and a variety of programs and games, and now I have the world's only TI-82 Plus. Please feel free to ask any questions about the build process in the thread. I will soon be creating a Cemetech Project Information Archive page about this project with all the pictures and steps necessary to replicate my work. That is so awesome! How about an 84+SE with the 82 screen? I would buy one of those. You ask an intriguing question. On the one hand, I've always dismissed the TI-84 Plus/Silver Edition LCD connection as opaque. On the other hand, the design of the TI-83 Plus Silver Edition (see this photo) makes it clear that there's some equivalence between the TI-83 Plus-style LCD and the TI-84 Plus-style LCD. I may actually do some experimenting with soldering a TI-83 Plus-style LCD onto a working but otherwise useless TI-84 Plus Silver Edition mainboard I have that lacks an LCD. I am glad this project is done; I've been looking forward to it. It looks great and was a great idea! It is too bad the TI-83+ keys fit so badly in the TI-82, otherwise we'd have an apps key. I wonder if there is any help... I have spare TI-82s (well one), so I wonder if we could use the 2nd key, sand off the old word, polish it so it looks normal, and then find a way to get the word Apps to look normal on it. Would be mighty cool looking if it was possible! Awesome work Kerm ! I tried to re-solder an old TI83 with a dead screen but overheated the PCB...better luck next time. At Cemetech, our ethos in calculator & device re-purposing and freely distributing our wares for the good of the community is a shining example to the rest of the world. Not to get off topic, but pro-tip: Cemetech is a free market economy. I suggest you look up the word "voluntarism" and how it applies to economics and political philosophy. This is a prototype, though, and it's supposed to replace the TI-82 Stats.Fr, so maybe the name will change in the future. Aww, no one mentioned my TI-82 Plus in that topic. Anyway, that's pretty fascinating. I need to get TI USA to send us along a TI-82 Plus and see how it compares to my custom TI-82 Plus. They're both TI-83 Pluses, correct? I spy an apps button on that 82+. © Copyright 2000-2019 Cemetech & Christopher Mitchell :: Page Execution Time: 0.087723 seconds.